Before your next state or CMS survey, make sure you have the facts. 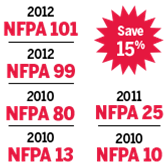 SAVE 15% on six vital NFPA® codes and standards for fire protection in health care facilities. Every facility manager, contractor, installer, maintenance professional, and inspector needs this CMS Set! Safeguarding patients and medical personnel in the health care setting requires a range of fire protection features that work together to provide a systems approach. Automatic fire sprinklers, fire doors, and portable fire extinguishers are all part of the life-saving strategy. To help you do your job -- and comply with recently adopted CMS regulations -- the CMS Health Care, Life Safety, and Fire Protection Codes Set combines the 2012 editions of NFPA 101®: Life Safety Code® and NFPA 99: Health Care Facilities Code, along with the 2011 edition of NFPA 25, and the 2010 editions of NFPA 13, NFPA 80, and NFPA 10. Confidently address fire protection issues and help meet the new CMS Conditions of Participation (COP) with this Set. The 2012 edition of NFPA 101: Life Safety Code with major changes that help provide protection from fire and related hazards, and requirements that allow more home-like environments for nursing homes and are more reflective of the design and operation of other health care facilities. The 2012 edition of NFPA 99: Health Care Facilities Code featuring a groundbreaking shift to a risk- vs. occupancy-based approach; new chapters on security, fire protection, and information technology; and updates to Chapter 5, Gas and Vacuum Systems and Chapter 6, Electrical Systems. The 2011 edition of NFPA 25: Inspection, Testing, and Maintenance of Water-Based Fire Protection Systems with provisions needed to keep systems ready for action. Key changes include updated ITM and replacement requirements for fire sprinkler systems and components in new and existing residential board facilities. The 2010 edition of NFPA 13: Installation of Sprinkler Systems presenting requirements for sprinkler system design, installation, and component options for health care facilities. Changes impact the placement of sprinklers in the clothes closets of patient sleeping rooms in new and existing hospitals. The 2010 edition of NFPA 80: Fire Doors and Other Opening Protectives to help health care facility managers and staff ensure proper installation, inspection, testing, and maintenance of fire door assemblies, fire window assemblies, and fire dampers necessary to the defend-in-place strategy used to avoid patient evacuation in a fire. The 2010 edition of NFPA 10: Portable Fire Extinguishers for the provisions you need to select, use, and maintain extinguishers correctly and train personnel to use equipment as the first line of fire defense. The U.S. Centers for Medicare & Medicaid Services (CMS) has officially adopted the 2012 editions of NFPA 101: Life Safety Code and NFPA 99: Health Care Facilities Code. Health care providers that participate in federal reimbursement programs are mandated to meet the new (CMS) COP based on the 2012 NFPA 101: Life Safety Code and NFPA 99: Health Care Facilities Code. This Set includes the 2012 editions of NFPA 101 and NFPA 99, as well as other NFPA codes and standards referenced in these editions. Facility owners and operators should consult with their Authority Having Jurisdiction (AHJ) to determine if additional requirements have been established by the applicable state or local jurisdiction. For more information and resources concerning compliance with the life safety requirements in CMS regulated facilities, please go to www.nfpa.org/cms.